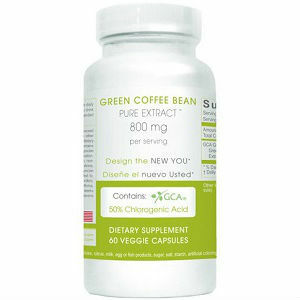 Green Coffee Bean Pure Extract refers to a dietary supplement which the manufacturer claims can help in weight loss. The producer alleges that this formula is not a stimulant that makes a person jittery or raises the heart rate. This formula is manufactured by Creative Bioscience, a company based in the USA which operates in FDA and GMP-approved facilities, according to the manufacturer’s website. We found out that this company specializes in a number of weight loss supplements. The main ingredient in Green Coffee Bean Pure Extract is 800mg of green coffee bean extract containing 50% chlorogenic acid. Our research on the manufacturer’s website led us to a study where participants who took pure green coffee bean extract lost an average of 17 pounds in 22 weeks. We also found out that there are plenty of studies which show how chlorogenic acid affects the slow release of glucose in the body while boosting metabolism to burn stored fat at the same time. The capsule for this product is made of vegetable cellulose. The manufacturer recommends that as a dietary supplement, you should take one capsule twice daily, 30 minutes before breakfast and lunch, with a full glass of water. If you want to see better results, you should continue drinking plenty of water throughout the day. We also found that you are not supposed to take more than two capsules in a day. We could not find any adverse or severe side effects associated with the regular use of this dietary supplement. However, the manufacturer clearly states that you should contact your doctor before starting any weight loss program. Contact your doctor if you are below 18 years of age, pregnant or breastfeeding before using this supplement. One bottle of Green Coffee Bean Pure Extract containing 60 capsules is currently selling at $32.95 on the manufacturer’s website. This is a special offer down from $59.95. Two bottles will cost $119.90, three bottles will cost $179.85, and four bottles will cost $239.80. Currently, four bottles are selling at a discounted price of $79.45. Six bottles of this product will cost you a total of $120.98. Green Coffee Bean Pure Extract comes with a 100% money back satisfaction guarantee according to the product page on the manufacturer’s website. However, details about refunds are missing. There very few positive reviews on the manufacturer’s official website, perhaps because it is not a widely used product or the site admin has filtered negative comments. Green Coffee Bean Pure Extract, as a dietary supplement, seems that it could be helpful in weight loss. The manufacturer recommends that it should be taken before meals with a full glass of water and we didn’t find any side effects associated with its use. This product also comes with some great savings when purchasing the product in bulk. However, there are very few user reviews which indicate it is not a common dietary supplement for weight loss. The lack of a clear money-back guarantee is also a downside to this product as it is unclear what the terms of for purchasing this product. A guarantee can also instill confidence in the customer that the manufacturer is backing up their product. It may be worth looking at other products that come with a clear money-back guarantee. Edward Tobias	reviewed Creative Bioscience Green Coffee Bean Pure Extract	on December 12th	 and gave it a rating of 2.5.